Rome travel? Stay at historic 5-star Sofitel Rome Villa Borghese in Rome center, close to Piazza di Spagna, Trevi fountain and haute couture boutiques. Restaurant and lounge bar on the upper terrace offer spectacular views of the Eternal City. One of the best boutique hotels in Rome-service, elegance, location: 81 luxurious rooms/suites/private terrace, 24-hour room service, business center, concierge. The Sofitel Roma Villa Borghese is the ideal place for your vacation in Rome. 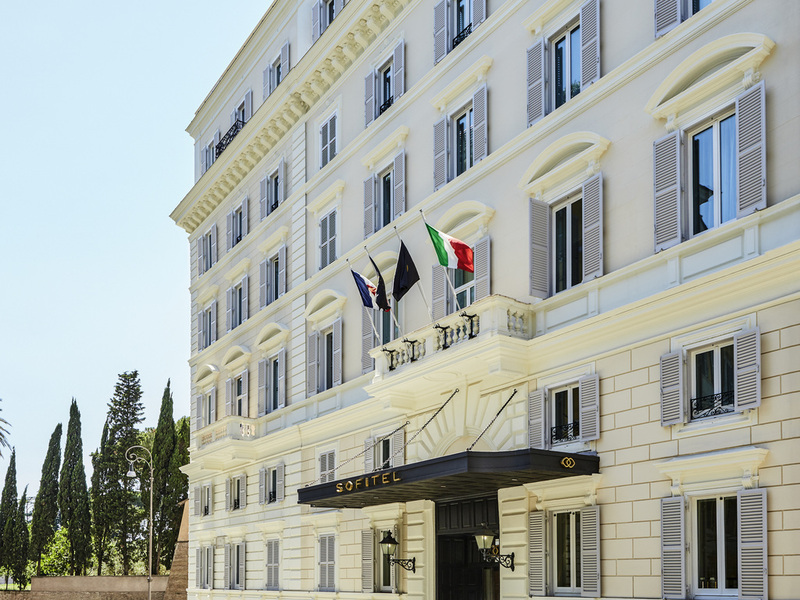 This elegant luxury hotel in Rome offers a wide range of concierge services. Discover the Eternal City in a unique way with Magnifiques Experiences Sofitel. This hotel participates to Planet 21 and is acting in favour of Positive Hospitality. The 81 luxury rooms in the center of Rome offer Sofitel MyBed® bedding, marble bathrooms, luxury bathrobes, WIFI and 24-hour room service. Prestige Suites boast a terrace with panoramic views. A 5-star hotel in Rome with views of Villa Borghese. My wife had a fall which necessitated immediate surgery in Italy, our departure point was Rome, the hospital was in Putignano. I booked through LeClub directly to the hotel for a 4 day stay at which time the doctor had cleared us to fly back to Australia. The hotel could not have been more accommodating, we were unsure of our arrival date because we were unsure of when we would be discharged from the hospital and how and when the 5 hour drive to Rome in an ambulance would take place. When we arrived we found a wheelchair waiting and a large room with walk in shower and disabled facility. The staff were most helpful both at the fr9ont desk and in the restaurant. Sometimes you take your hotel for granted, service like we received cured us of this we are ever grateful to management and staff. Michael and Margaret R.
Loved this hotel, staff. Location was great, not in center but close enough to be able to walk there. We received an excellent level of service that was consistent with that we are accustomed to from the Sofitel brand. The Sofitel Rome Villa Borghese is quite a small hotel but has a great deal of charm. It was very well located for walking to many of the major points of interest aswell as a great variety of restaurants just minutes away to cater for differing tastes and budgets. The staff based in the lobby are most polite and attentive. They are very knowledgable and also patient with guests. Equally the Terrace Bar and Restaurant team are very good too. The breakfast is excellent and dinner was a delightful experience. The hotel is about to close for a programme of major renovation. I am confident this will greatly enhance what really is a gem of a hotel in the Eternal City. We will return soon after re-opening. Professional and nice hotel in good location a short distance from the Spanish Steps. The staff are very courteous, friendly and helpful. The roof deck is nice for breakfast or an afternoon drink. Only negatives would be that the rooms are small and fairly dated - the decor was old and quite honestly the room was a bit smelly! The bathroom was very small, bordering on uncomfortable, the shower leaked and the lights flickered. For Rome, and the location, the price was very reasonable, I perhaps had just expected more from a Sofitel. Door men were incredibly assistful. Front staff was adequate but not overly attentive. The hotel is in a good location but the quality of the room is awful. The staff is not that friendly. The first room felt like a dungeon and the second room had a sewer smell. We stayed 3 nights because we prepaid and we would lose the money but we left 2 nights early to a different hotel. The NH collection. The staff at the hotel was wonderful. They provided an excellent level of service and wanted to help make our stay a very memorable one. The location is great--only a couple of blocks away from the top of the Spanish Steps. Go to the rooftop bar--the view is spectacular. The only complaint is the air conditioning in the rooms. We had 5 rooms and only one room had adequate air conditioning. Given the price of the rooms, I expected better air conditioning. A enjoyable Roma experience. The staff was very attentive and helpful. Great location. Beautiful rooftop restaurant. Prices for lunch and dinner extremely expensive. great hotel, great location, wonderful staff! It was an excellent stay. You can select up to 6 favourite hotels. To benefit from this service, you must be registered. If you do not have a personal account at accorhotels.com, register now to enjoy the benefits of this service. Lowest prices found over the following seven days. These prices may be based on different room types. Depending on the country, these prices may not include taxes, may include VAT only or may include all taxes (VAT and city tax). When prices do not include all taxes, the relevant taxes (VAT and/or city tax) will be stated in the following stages of the reservation process. The price is only guaranteed at the time of reservation. Hotel classifications (1 to 5 stars for France) correspond to criteria laid down by local regulations.